times forcing me to flee to my designated bomb shelter: number 695 on the corner of Amatzia street and Yehoshaphat. In Jerusalem I have 90 seconds. Although I managed to reach the bomb shelter in enough time (thank you Coach Bill Wiener) unfortunately I found it locked twice. My life, and the lives of others desperately waiting to get inside, were put in danger. Why? I don’t have a good answer. But maybe Chabad does. Chabad opened a synagogue inside the bomb shelter and kept it locked. One night I met the teenager they hired to open the bomb shelter in case of an attack. I met him as he was unlocking the door more than an hour after the missiles were launched (and thankfully destroyed). Rabbi Tamir Kastiel, the director of this Chabad branch, claims he legally rents the bomb shelter from the municipality. But when I asked to see documentation of this contract he said he will get back to me. I’m still waiting. Could it be they are squatting there illegally? Is the municipality allowed to rent out a bomb shelter or is someone in city hall making money under the table? (Olmert anyone?) Could it be that someone who works in this local branch cares more about a Torah scroll being stolen than the lives of human beings? 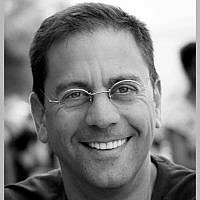 I don’t know but you can ask Rabbi Kastiel at chabadkatamon@012.net.il. Today he told me the shelter is now open 24 hours a day. That’s nice. Thank you. But who will take responsibility for the fact that a Jerusalem bomb shelter in the State of Israel during a war was locked when we were under at least two missile attacks? I hope this article will motivate all organizations (not just Chabad) that are “renting” or squatting in bomb shelters to open them up all the time day and night. There is a war going on. On another related frustrating topic, I recently downloaded a free war-time application for my phone called מרחב מוגן which uses GPS to tell you where the nearest bomb shelter is in relation to your current location. While I appreciate that the app is free, in addition to the 6 seconds it takes to start to work the developers decided to program it to show you a 5 second advertisement – advertising their services. Five seconds! I don’t care if its for free – I think it is deplorable. In Southern Israel you only 15 seconds until the missile hits. This app gives those people only 4 seconds to look up the address of the nearest bomb shelter and no time to run to it. 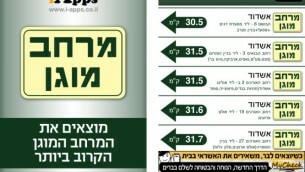 A suggestion to the app makers of מרחב מוגן: Why not show the advertisement 5 minutes after the app is activated. That way the user will be still be alive to employ your services. This is an app made in Israel that I’m not sure will appear in the next edition of Start-Up Nation.